On the 26th of August 2018, the EPA’s ENERGY STAR energy performance rating program is set for its largest update in years. Scores are set to change and getting the label for office buildings is about to get tougher, but ultimately more rewarding. The ENERGY STAR program uses data from the Commercial Buildings Energy Consumption Survey (CBECS) to find median energy efficiency levels for different types of buildings and assigns a score in Portfolio Manager based on the size, type and energy consumption of a building in relation to the median levels of similar buildings. The median score is a 50 in Portfolio Manager, and buildings that perform at least 25% better (a score of 75+) than this median are eligible for an ENERGY STAR Label. Currently, the ENERGY STAR program uses 2003 CBECS data to determine these median performance levels against which other buildings are compared. As commercial real estate owners and managers have put more emphasis on energy efficiency and sustainable practices in the past 10 years, the average energy-efficiency levels of most of these buildings have increased substantially and as a result, the average performance levels from the 2003 CBECS data no longer hold true. 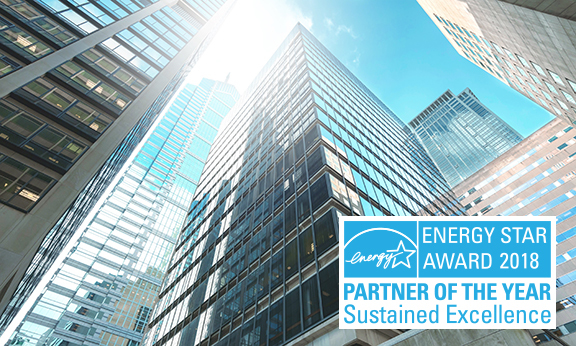 This leads to more than 25% of buildings on Portfolio manager being eligible to be ENERGY STAR certified, which lessens the value of the label and its significance. With the update, the ENERGY STAR program will use the more recent 2012 CBECS data to find new median performance levels for different building types and will re-assign ENERGY STAR scores to buildings based on comparisons to these new averages. This change in comparison data is expected to result in a drop of 10-12 points in the ENERGY STAR score for the average office building trying to earn an ENERGY STAR label after the changes go into effect. What types of buildings will be affected? Other types of buildings will undergo different changes in their scores to office buildings – schools, retail stores and worship facilities are also expected to see scores go down, while Warehouses and Hotels can expect to see their scores go up once the new data is used. With the changes going into effect in late August, all buildings with a current score of 75 or higher are eligible to earn their 2018 label before the changes occur, regardless of when they were last certified with a 2017 label. As long as your building has energy data going through 4/30/2018, it can be certified with the current scoring method. The deadline to submit with the current scoring method is 8/26/2018. SIG is holding a lunch and learn at our Atlanta office (5607 Glenridge Dr, Suite 250) at 12pm on the 6th of June; join us for a more detailed run-through of the changes and a chance to talk to SIG’s engineers about how the changes will specifically affect your building and how we can help make the process easier for you.